Shannon Bartruff discusses the play he wants his team to run during a timeout in a game from the 2016-17 basketball season. Bartruff announced his resignation as head boys basketball coach for the Washington Blue Lions on April 2, 2018. Washington High School boys varsity basketball coach Shannon Bartruff resigned from that position on April 2 after seven seasons. Bartruff led the Blue Lions to a record of 80-79 over seven seasons with a South Central Ohio League championship in the 2013-14 season. Some of the highlights for Bartruff included wins that year over Bishop Ready, ranked No. 5 in the state at the time. Bartruff, a 1998 graduate of then Washington Senior High School and a 2003 graduate of Otterbein University, said that he is remaining as a business teacher at Washington High School and will continue as the Blue Lions’ golf coach. “After I started coaching with Coach Sheridan, the following year I joined John Enochs’ staff for football,” Bartruff said. “Then Rob Smith asked me to help with baseball. “After Derek left and Coach (Gary) Shaffer came back, I was his j-v coach for a couple of years,” Bartruff said. “He started to groom me to get me ready (to be the varsity coach), so I was his varsity assistant the last two or three years. I’ve thanked (Shaffer) a hundred times and I couldn’t thank him enough for being that coaching figure that I could look up to, not just as a coach, but as a man. For everything that he stood for and how much respect I had for him when I played for him. “My coaching style is a little bit different than Coach Shaffer’s,” Bartruff said. “But, the foundation, our principles, our morals, our beliefs, what we were going to be based on were exactly the same. Which is, there are two things you can control every day — your effort and your attitude. Those are things that we preach to our kids. I think you could even ask some of our kids at the junior high and even at the biddy level, some kids that have been ball boys for us and they would know the answer to that question, if you said, ‘what are the two things you can control on a daily basis?’ It’s your attitude and your effort. “We have a quote painted in our locker room that life is 10 percent what happens to you and 90 percent how you respond to it,” Bartruff said. “Basketball is a microcosm for life. There are things that happen in daily practice, there’s adversity, ups and downs, highs and lows, wins and losses, pain, struggle, the whole thing. It teaches you a lot about yourself, as a player and as a coach, about how you respond to those things. “One thing I always prided myself in and our program in, is making those correlations between ball and life,” Bartruff said. “I’ve been blessed the last seven years. I don’t remember what year it was that I began coaching with Derek Sheridan. I was there all the way through Coach Shaffer’s last stint. I’m going to guess that I’ve been involved in the basketball program, in some capacity, for over 10 years. “Jeff Hodson (former WHS principal) hired me in, maybe it was his last year,” Bartruff said. “I’m very blessed and fortunate and appreciative of him for giving me the opportunity. I’ve coached a ton of great kids, great players, great student-athletes. There were kids that maybe weren’t the most-blessed physically, athletically, but they gave us and our program everything that they had for four or five or six years, going back to junior high. “I’ve been blessed to have a great coaching staff,” Bartruff said. “We’ve had a couple of different j-v coaches that have gone on to other careers. There were a couple of dads who were on board, in Keith Eckles and Brent Knisley. They were great coaches, but, much better fathers. “I was very appreciative to be able to coach with my brother, Shad,” Bartruff said. “He’s a great coach and just had to step away because of work. “Our league has been full of great coaches and great friends that I’ve made over the years,” Bartruff said. “I’m thankful for all of their help and support. Also, long-time score book keeper Jerry Mount. He’s been a part of our program for probably close to 30 years and kept our book the last seven years. “I’d be remiss if I didn’t thank our long-time photographer, Mary Kay West,” Bartruff said. “She is Blue Lion Athletics — outspoken, yes; opinionated, yes; passionate about our kids, yes. She’s a saint. “I also want to thank the Walters family, the Day’s and Janet Bick,” Bartruff said. “They made our chicken noodle dinner a great success and we could never have made those happen without them. And our cooks, Barb Coil and Judy Thomas. “Lastly, I’d like to thank all of the support that this community has give our program over the years,” Bartruff said. “They don’t get enough credit. I was rarely told no when asking for donations for our program and our boys appreciated the support. “I appreciate all the support I’ve received from my family,” Bartruff said. “My parents came to a bunch of games. I have a little niece now. My sister brought her to a couple of games. It’s been a blessing to be the coach. Coach Shaffer and Mrs. Shaffer came to many games. Jeannie kept my stats all the way through this year. She’s been doing that for probably 40 years. “My heart’s always going to be in Blue Lion basketball,” Bartruff said. “I want to thank Shannon for everything he’s given to Washington Court House, Washington City Schools, Washington Athletics,” Washington High School Athletic Director Mark Bihl said. “He’s gone above and beyond. He’s committed himself, not only to the school, but to the purpose of the school, the purpose of the athletic program and the student-athletes themselves. “I know over the past few days, since the end of the season, it’s been something he’s been considering, hanging his whistle up as head basketball coach,” Bihl said. “A lot of the kids he’s coached over the years have already reached out to him and informed him of how much of an impact he’s had in their lives. “Where do we go from here,” Bihl posited. “We just opened the position up (Tuesday, April 10). It will remain open until April 18. Any interested parties need to submit a letter of interest along with their résumé to myself. That can be delivered to Tina Wilson in our main office or it can be e-mailed to me (mark.bihl@wchcs.org). “We’re excited for the future of Washington Court House athletics,” Bihl said. “We have a panel selected, including Mr. Tracy Rose (Washington High School Principal) and myself, along with some other individuals will delineate. Through some interviews and discussions, we’ll make our recommendation to Mr. Tom Bailey (Washington City Schools Superintendent). So long as he sees that the individual fits for the purpose of Washington Court House athletics, he then will recommend that individual to the school board. “We don’t want to speed things up too much,” Bihl said. “We are very fortunate in the state of Ohio that we have an athletic director’s network. That is, we can post pretty much any job opening, game need. We also have a lot of networking in the Southeast District. We have seen a large need for coaches in the Southeast District, as well as across the state of Ohio, in multiple sports. https://www.recordherald.com/wp-content/uploads/sites/27/2018/04/web1_Shannon-Bartruff-coaching-pic-from-2016-17-season-1.jpgShannon Bartruff discusses the play he wants his team to run during a timeout in a game from the 2016-17 basketball season. 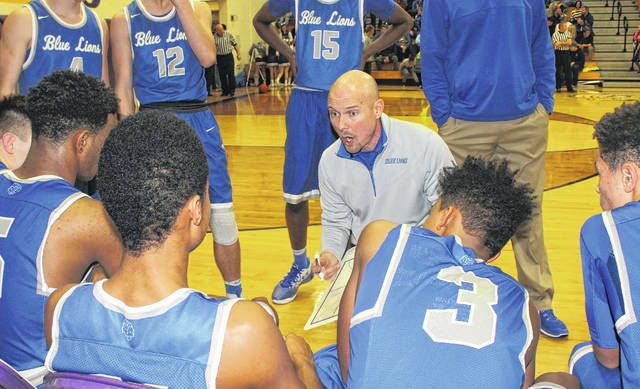 Bartruff announced his resignation as head boys basketball coach for the Washington Blue Lions on April 2, 2018.